This one is a little different in that you're not filling in a dialog balloon, but rather coming up with a caption that might appear above or below the image. I'll pick out some as my personal favorites to highlight in a post next Monday, and then I'll choose one of those to bear the standard as the "Featured Creator of the Week" atop the right tool bar. I’m guessing this is from an Ambush Bug comic, judging by the drawing style. And content. You ARE getting fries with that AND I SUPER~SIZED them! Bwa-haha! Anti-life equation?…It’s Mayor McDarkseid, to you, lowly patron of conveniently located markets that serve inexpensive food prepared in a quick fashion. We are out of that rib sandwich thingy. After being fired from his last job, the former ruler of Apokolypse must start at the bottom of the totem pole. Humiliated at his new job, the new cashier hated when his friends would show up unexpectedly. Desperate to find extra funds for education, a ruler takes on a new job to help those in need. Rebulicans will make it so only mineal jobs are available. Thanks to connections he had, Darkseid thought he could blend in with the locals just fine. New Genesis is no match for the Golden Arches! Unfortunately for Highfather, he hasn’t seen Super Size Me. Can Morgan Spurlock save him in time? From the Dark side of the bun! Obama care has made us all have to work a little mor eto make ends meet. The real evil behind Ronald McDonald. Darkseid had fallen hard for Death and stalked her in all her favorite places. Darkseid’s latest ploy to hide the Anti-Life Equation in Happy Meal puzzles didn’t go according to plan. Realizing that the direct approach to villainy was generally met with strong opposition, Darkseid tried a more subtle approach to destroying mankind… one meal at a time. Despite his past indiscretions and his gruff nature with patrons, something about Mr. Darkseid just said upper management. Suddenly the whole Chick-fil-A thing didn’t seem so bad. To be honest, Superman’s Super-Villain Rehabilitation Program was met with mixed reviews at first, but now… no, still a bad idea. 1. The galactic recession hit Apokolips the hardest. The fast food worker disguise wasn’t fooling anybody. Lois: I see, and what are you’re former enemies doing now? Superman: Lex said he could find them jobs. I don’t see what could go wrong. Superman’s surprise led to his burgers being burned terribly. First, we saw the end of The Burger King’s reign. And now The Clown is no more. Next target: The Colonel. #%!! @ @$$&!! !!!#$$#%!! NEW 52! 2. On a good day, James wasn’t mistaken for Darkseid. 1: McDonalds opens a booth at Comicon. 2: After Marvel won their infringement lawsuit, the Dr. Doom clone Darkseid was relegated to comic relief roles. 3: Even Parademons gotta eat. 4: See what happens when you can’t spell Darkside, kids? Stay in school! Side-note: I recorded this entry as an mp3 file but don’t have a means to link it directly. I guess I can e-mail it. Anyone interested in hearing the historic first-ever HeroMachine Caption Contest audio entry, please send me a PM from the Forums. 1. 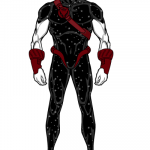 The surprisingly successful Occupy Apokolips movement has seen Darkseid, Absolute Ruler of Apokolips and Master of the Anti-Life Equation, have to take on a second job at night to cover his short-sold stock options. 2. As it turns out, the Anti-Life Equation is best suited for making fries. 3. The New 52 (billion served)! during his last attempt to bring about the apocalypse Darkseid found a better way to deliver mayhem and destruction. 1. Finally done with being beaten by the Justice League, Darkseid decided to go for his dream career. 2. Before being the ruler of Apokolips, Darkseid had to start from square one, just like us. 3. With all his debts pilling up from his numerous defeats, Darkseid had to find a way to make income. 1. Complaints mysteriously stopped at one location. 2. When a manager is not a people person, they are more likely to have high turn-over rates, staffing problems, and the need to double as a worker. 3. A federal grant was issued to determine whether fast food consumers have more heart attacks. 4. Sometimes the other line is longer for a good reason. 5. Tipping is not required, but survivable. 6. As if Joe’s shift wasn’t already difficult, mysterious people kept coming in and asking him about the guy who forced him to swap clothes in an alley. What he looked like . . .
7. The hiring manager would never admit he was deaf in one ear, and so didn’t realize the odd man said he wanted to “work as an archNEMESIS” instead of work FOR THE GOLDEN ARCHES. Do you want DIES with that? Darkseid plots on how to become manager of McDonalds and take over The Universe by turning The New Gods fat and lazy Bwa HaHaHa!!! 2) CUSTOMER! See how you like it! 1. You’re going to get it his way. 2. Judging by his face, McDonald’s newest employee was having a rough first day. 3. He never thought getting beat by Superman would be the high point of his day. There is no evil so small that he will not turn his hand to it. 5: The new Ronald proved unpopular with customers. 6: It’s always embarassing to see a successful friend when you’re at your menial job, but at least Darkseid could disintegrate them. 8: The secret sauce was emitted by Parademons. You don’t want to know how! You want fries with those Omega Beams? 3. For some reason, no one ordered a Happy Meal that day. Where the coffee is too hot, and the service is ice cold. Solved the Anti-life equation…next on Darkseid’s agenda is to solve the Specail-sauce equation! Well who is going to be dumb enough to ask for Darkseid’s green card?!? He gives great cuss-some-more service. Tonight at 9:00, on Seinfeld-Rebooted, ‘The Hamburger Nazi’. 10: Darkseid bet the Joker he couldn’t break Batgirl’s back. Well someone’s in a ‘get out of my way inferior creature’ mood today. Have you tried the Happymeal? Ugh….how much do I owe you? 2. Darkseid was. And so — Darkseid is…broke. 3. I hope you appreciate, Kal-El, that everything that happens from this point is on your hand. The grills will rain fire, the grease will boil, the streets will run red with the ketchup of billions served. (2 is based of a Darkseid quote from the comics. 3 is based of a speech he gave to Superman in the last episode of JLU. 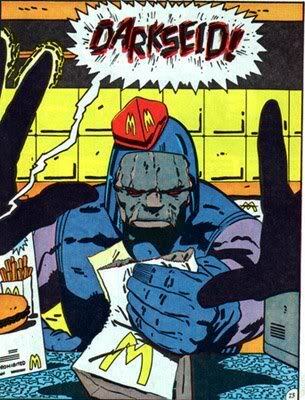 And in an instant, Darkseid’s secret identity as common, minimum-wage McDonald’s employee was exposed. Apparently he wasn’t loving it. Does it have to be a caption only, or can that caption include dialogue? Dialogue is fine, so long as it’s funny. I generally find that’s more of a challenge with this sort of thing. Darkseid learns that the true Anti-Life Equation is eating crappy food. Have you ever tried MAKEUP? It can really take off that darksied! Sorry for the long delay, results coming up in a moment.